Sharing your life with greyhounds is hard. I suppose sharing your life with any canine is hard, but when it’s greyhounds, it is more so. When you have a dog, and it stops eating or it starts limping, you don’t automatically think stomach cancer or osteosarcoma. But with a greyhound, you do. Why? 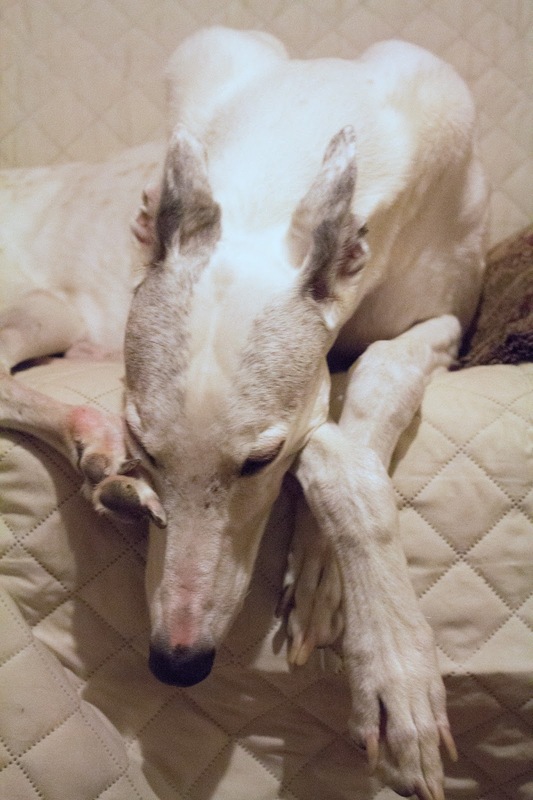 Because the odds are high that a limping greyhound has osteosarcoma. Or one that isn’t eating has stomach cancer or some other equally nasty health issue that will limit lifespan. 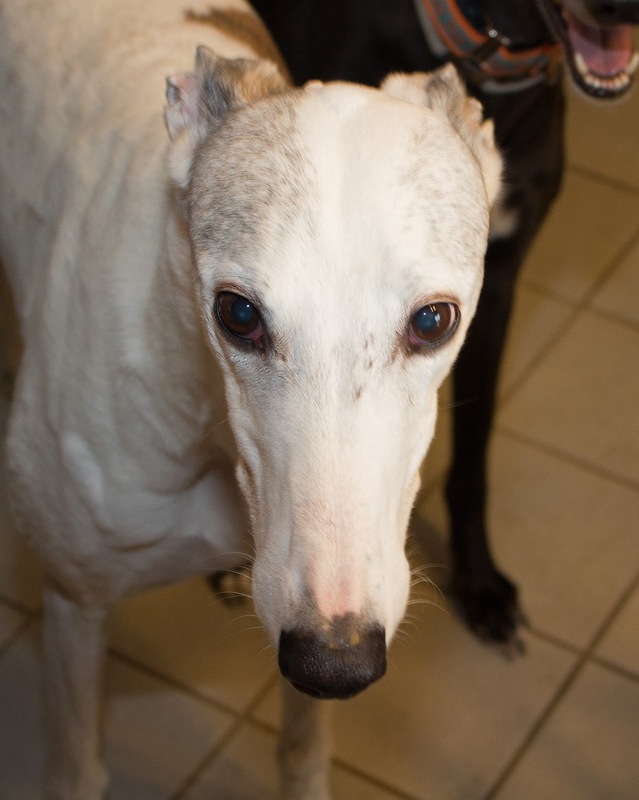 When you have a greyhound that reaches age 10 or more, the odds go up astronomically that a health issue that might not seem so dire in other dogs means something very bad for yours. We have dear friends who have an older greyhound and they are facing these odds now. It hits home for me because their hound, Vinnie is so similar to Blue its scary. They’re the same size; they both have all sorts of odd lumps and bumps. They’re both white with some patches of color and adorable spots. As they’ve aged, their color has faded to the point where sometimes you mistake them for each other in photos. And they’re both about the same age (Vinnie is about a year older than Blue). Vinnie has recently started to display clear signs of pain and he’s off and on with his eating. Now, mind you, Vinnie has always been a bit of a finicky eater (at least since we’ve known him). And he had a hock fracture that ended his racing career which has always caused him some pain, especially when he has been standing for awhile. But recently he has been having a lot of difficulty with his hind end. Standing is difficult. Going up and down the few stairs to his backyard has sometimes required assistance from his Mum and Dad. Getting on and off the couch (his favorite place in the world, and it is HIS couch) has been a struggle. but the fact that he isn’t eating so much is concerning. They sent him home from his last visit with special canned food that seems to be of interest to him. He has pain meds which seem to be helping him. But we hear from Vinnie’s Mum that it’s a step forward and a couple steps back. Everyone who loves him is trying not to think the worst. But of course, when you have a greyhound that is exactly what you do. After reading Pat’s email of a couple days ago I have been thinking about Girly Girl, and the fact that Blue is Vinnie’s age and has hind end problems of his own. And that Vinnie’s brother and sister both passed of cancer (Emma with osteo and Jim with stomach cancer). And that Blue’s littermate sister Bea passed from osteo and his half brother Fox suffered terrible medical problems before we had to let go of him in January. A greyhound reaching age 10 has beaten many odds. With Blue turning 12 in December and Vinnie either at or on his way to 13, both have dodged many a proverbial bullet. But how many times can you cower under a table while the dropping bombs land on other people? How long before that bomb with your name on it rains down? As I told Vinnie’s Mum, the ONLY thing that is good about seeing it coming is that you have time to say all the things you want and need to say. Girly Girl and I had many a deep conversation and I believe that she understood. If not the words, then at least the sentiment behind them. When she left I felt like she knew she was loved beyond reason and would be missed forever. Blue and I have been having similar conversations of late because I hear the bombs dropping all around us. I realize it’s a zero sum game. No one gets out alive. But does it have to be now? Can’t it be next year? Or the one after? We are sending every last ounce of positive energy we have to Vinnie and his family. If you have any you can spare, please consider sending out some positive thoughts for them as well.